Woohoo! Sister Location came out yesterday! I initially wanted to draw something special for this game's release but since the personalities of the cast weren't so clear at the time I decided to hold off from making a completely finished picture until the game actually came out, and I'm glad I did, because these sketches were done beforehand, and I swear, I somehow got everyone's personality wrong! Except for Ballora I guess, but her voice was leaked and that made hers pretty obvious. Anyways, these guys were supposed to be meant for just practicing facial expressions while I waited for the game's release, but I decided to color them too, because why not? Ballora, Baby, Funtime Foxy, Funtime Freddy, and Five Nights at Freddy's: Sister Location belongs to Scott Cawthon. Please do not use my art for anything without my permission or proper credit, thank you! This is so cool! The expressions on this look great! He looks like he could use one. I love how you draw I can bearly draw as good as you. My art skill is crappy compared to most Disney animators, but the more I practice, the closer I get to whatever skill level I wish to be at. i love you art can you make more. Rest assured though, I will post more! That Easter Egg was actually unintentional too. Her eyes were green when I first colored the sketch before Sister Location released, but after I played the game and looked back on the sketch I decided to recolor her eyes to blue. This way, she was her happier self from the death minigame and her posture in the sketch would make more sense, however I accidentally left some of the green in her eyes, therefore creating that little "Easter Egg". Anyway, thank you, and here's a Llama for your eagle eyesight! Aw, thank you! I appreciate it. She does look very happy. :3 Good job! 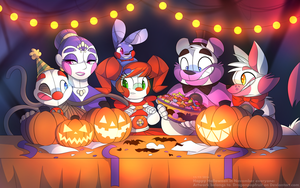 I purposefully left her out of this, you can find Bonbon here though! Funtime Freddy looks so cute! I love the way you draw him! Thank you so much! Funtime Freddy is fairly fun to draw too!